there's an Accident on the New Jersey Turnpike - Western Spur northbound North of Interchange 15E - US 1&9 in Newark. All lanes open. there's an Overturned tractor trailer on the New Jersey Turnpike outside entry Interchange 10 - NJ 440/I-287 in Edison Twp Right lane on the ramp from Route 440 south to the toll plaza is blocked. there are Delays on the New Jersey Turnpike - Western Spur northbound from Southern Mixing Bowl in Newark to North of Interchange 15W - I-280 in Kearny 3 mile delay. there's Long term road construction on the New Jersey Turnpike southbound at Thomas Edison Service Area in Woodbridge Twp the service area is closed to the public for renovations until further notice. there's Operational Activity on the New Jersey Turnpike - Hudson County Extension eastbound from Interchange 14 - I-78 in Newark to Interchange 14C - Toll Plaza in Jersey City right shoulder is open to traffic when the green arrow is on. there are Delays on the Garden State Parkway southbound from North of Exit 142 - I-78 in Hillside Twp to South of Exit 138 - CR 509 in Kenilworth 3 mile delay. there are Delays on the Garden State Parkway northbound from North of Exit 142 - I-78 in Hillside Twp to Exit 145 - I-280 in East Orange 4 mile delay. there are Delays on the Garden State Parkway southbound from South of Essex Toll Plaza in Bloomfield to North of Exit 147 - Clinton Ave in East Orange 2 mile delay. there's Long term road construction on the Garden State Parkway in both directions at Garden State Parkway - Monmouth Service Area in Wall Twp The Service Area is closed to the public for renovations until further notice. The Park and Ride - Academy Bus lots will remain open for daily usage. 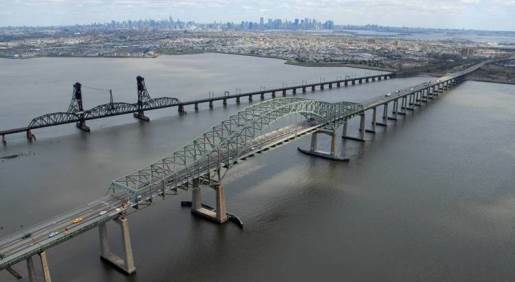 The eastbound right shoulder of the Newark Bay-Hudson County Extension was used part-time as a travel lane to relieve congestion during the Pulaski Skyway closure. The use of the shoulder as a third lane will end as of May 6th. The Turnpike Authority has been replacing the deck of the 8.2-mile Extension under a series of construction contracts over the past decade. Some of the work was deferred because it would have conflicted with the Pulaski closure. With the northbound Pulaski now open, the deferred work on the Extension is about to get underway, and the shoulder will no longer be available for travel.